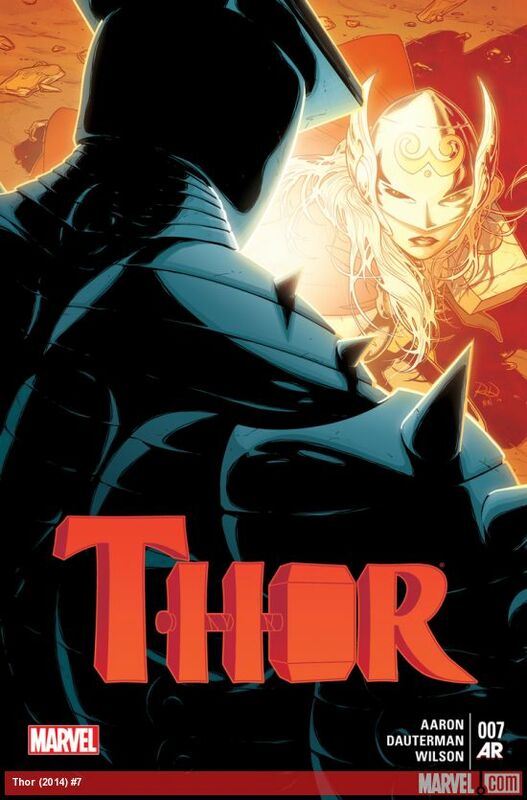 The November 2014 Reboot of Thor is still an action-packed and interesting comic. Now on its 7th issue with more amazing artwork and story to tell. We start with a possible hint of who the new Thor is before she took upon Mjolnir and the name of Thor with a prequel sequence from that character’s point of view. Though it hasn’t been confirmed that this woman of S.H.I.E.L.D. has taken upon herself the title of Goddess of Thunder. I personally get the impression she isn’t, though it could be. The reveal just seems far too easy, I hope that the reveal will be a more shocking surprise. In previous issues the hint was given that it could have been Frigga, mother of Thor Odinson. But turns out she is not the new Goddess of Thunder. If it is this S.H.I.E.L.D Agent, I will be very disappointed in such an easy reveal. But don’t worry, it’s been confirmed we will learn just who she is behind the scarlet cape and mask in the next issue. Just one issue away from the big reveal we’ve all been waiting for. We know from before that the former Thor -going by Odinson- has accepted his fate and has given the new Goddess of Thunder his blessing. Though he still searches to discover just who she was before. While his father is still furious about the entire situation. In a fuming last resort, he sends The Destroyer. To what? Destroy Thor, of course! To destroy and reveal her former identity, as usual. Odin can never accept change, can he? Though very typical of Odin, it gives a good tension to the story. Before the intense climatic battle really starts, we get some previews from other points of view. Odinson still seeking answers, though the news from his mother about what Odin is doing changes his path. I rather like how Odinson is so supportive of the new Goddess of Thunder. It shows his humbled beloved character, a short scene of the Dark Elf Malekith and Agger where Malekith looks forward to watching Thor get beaten up by The Destroyer, while Agger doesn’t seem to care to watch let alone enjoy the action. This shows the difference between the two conspiring together. For me the transition felt off. The scene does seem to be something the audience needs to see and understand. Yet it still felt a little off to me, feeling like it really didn’t have importance for this particular issue standing on its own. Yet I get the impression that it’s vital information for future issues. Thor and the Destroyer’s battle becomes quite intense. Mjolnir is used against her and it’s not looking too good. The artists don’t hold back illustrating a bloody Thor. Her cape and clothes quite ripped. Bonus points for not making unrealistic rips in a sexual manor. The drawing of the blood could be more realistic, showing the source of the bleed with some gashes without getting too graphic. I’d suggest adding a bruise or two. The art in the scene is still clean, but still gritty with warm red, yellows, and oranges to give a very heated feel to the intensity. Giving the audience the pain Thor is going through. The creators behind this comic excellent gave an excellent feel and portrayal to a very climatic scheme in the story of The Goddess of Thunder. From the script, pencils, inks, colors, then to the editing and compiling together has brought forth a product worthwhile. The readers can feel the tension in this climatic comic. It’s quite an enjoyable tale to be told. The overall story was decent, it really just felt like a filler. With uncomfortable transitions to other scenes, though looking closer does bring more relief. I felt like the possible hint of who Thor is really unsettling. If the S.H.I.E.L.D. agent really the new Thor then a horrible giveaway. I hope it’s another hint to throw the audience off. One of the major strengths of this story was good character portrayal. The climactic battle sequence gave a realistic feel. You can just feel Thor’s pain as she fights the Destroyer. It was an excellent use of writing and art but overall it certainly wasn’t one of the best issues of this series. Though looking back and looking with a more critical eye it’s an important set up for what is to come. We can hope that the 8th will make up the slack this one gave.